SUPPERCLUB is an event held in conjunction with houseguest opening receptions. 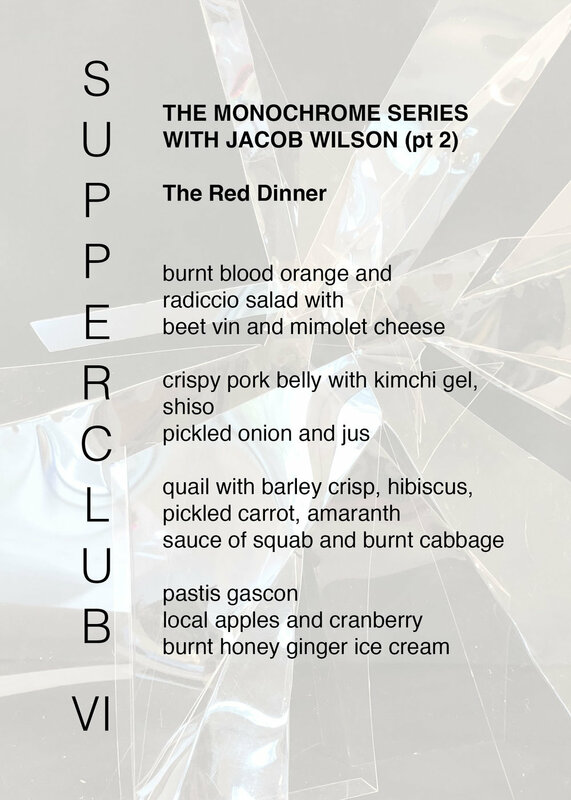 Each SUPPERCLUB is held the Monday following each opening reception and is an exploratory project for Jacob Wilson (half of houseguest / Sous Chef, 610 Magnolia) and occasionally other chefs from around the region. If you would be interested in being a guest at one of our SUPPERCLUB pop-ups, please fill out the form below. We are working to create an open and inclusive opportunity for any and every one to meet and discuss food and art in a casual setting. If so, please provide first and last name. There is a suggested donation of $50 / person, but we offer SUPPERCLUB at a "pay what you can" rate. Will you be making a donation? Thank you for your reservation. We will be reaching out with you shortly! we are admittedly way behind in updating this page. Please be patient as we upload all images of our previous dinners and menus. III: 14th May 2018: Jacob Wilson Chef 610 Magnolia.